On Saturday, September 15th, the Mount Saint Mary College Knights suffered their second home loss of the season, falling 3-0 to the undefeated University of Scranton Royals. The loss dropped the Knights to 2-4 on the season while the Royals improved to a 5-0 record. The game started off with the Knights instantly on the back foot. After much back-and-forth play, the home team nearly got on the board first when Matt Pagano’s header off a throw-in went just wide of the post. As momentum shifted in favor the Knights, Junior, Sean Lockwood went straight for goal with his corner kick attempt, missing only by inches. With two minutes remaining in the half, the Mount’s Alex Tolman was played in behind the Royals’ defense, but he sailed his lob over the goal. It was a valiant first half effort by the Knights who were unfortunate to head into halftime without a tally. But they struggled to generate consistent chances against the Royals side that pressured well throughout the second half, and it was the visitors who took the lead in the 48th minute with a goal from Nick Paganelli. The Mount boys would then go down by a 3-0 deficit thanks to goals from Michael Romano and Rich Loeffler. The Knights would come back strong four days later by defeating Bard College by the score of 6-0. Goalkeeper, Matt Darling stood on his head to preserve the shutout, while Alex Tolman led the scoring charts with two goals. 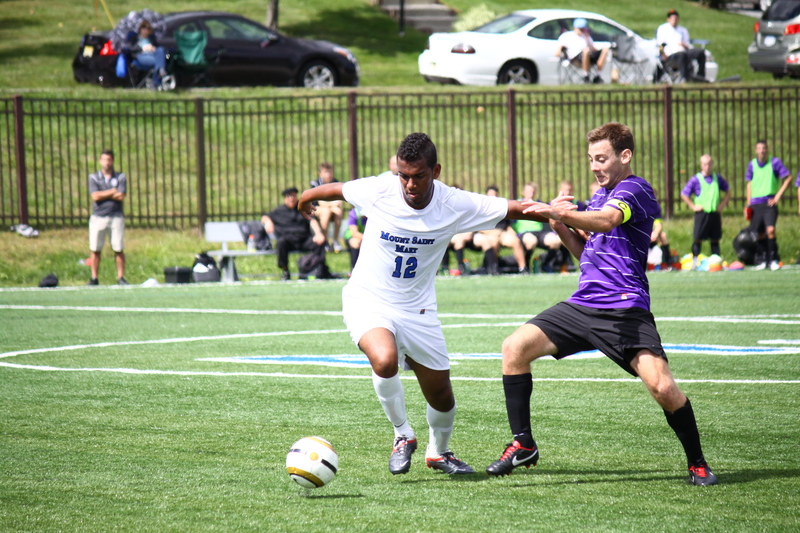 You can watch the Mount Saint Mary College Men’s Soccer Team when they face off against the College of Mount Saint Vincent on Wednesday, September 26th at 7:00 p.m.